Jesus pronounced that His act of service was to be imitated by everyone who would follow. He further would assert that His example would be emulated by every believer that followed after Him. Our service to our brother, or sister is to help them become clean Christians. We have this ministry of the basin and towel to remove the dirt and filth that comes from walking in this world. Of course, we cannot remove sins. But we can serve as Jesus would and intervene with His power. While in my first year of Bible college, I developed a bitter dislike for a classmate. He had been a lead guitarist; he was handsome and popular, and he oozed pride from every pore (at least I could see it). I actually took it on myself to be God’s hand in humbling him. I became antagonistic and scorned him every chance I could. Within days, my prayer life shut down, the heavens became brass. One day I was praying and the Holy Spirit graciously zapped me. I became aware of my sin toward my brother, and I repented. There was a real definite leading, to find a basin and a towel, and then to wash his feet. God reconciled us, as I kneeled at his feet in that dorm room. From that point on we became very good friends. We must go lower still. We must scrub our way into the heart of our sister and brother with a basin and towel. Water always finds the lowest point, were it pools and gathers. When we lower ourselves even deeper we find His presence waiting for us. But we must cleanse our own hands first, and His blood must work its ministry on me. It’s then I can proceed to clean the filth off of their feet. If I am not clean myself I will only perpetuate the dirt on to my brother with my dirty hands. The challenge for us is exceptionally real. Christlikeness will always demand this humble grace. When we think about being like Jesus we must make sure we are following the Jesus in the Bible. 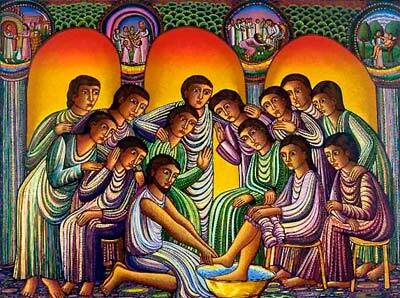 The Jesus who washed dirty feet as a slave. Let us not have any foolish nonsense of a discipleship that doesn’t kneel before our brothers in humility.